Between thunderstorms this week I was able to complete painting a front entry door to look like wood. I matched the front door to the garage door I had already painted to look like wood. I first painted the garage door. This garage door has the sun burst windows as the top row. It takes about 4 times as long to paint a row with those sun burst window frames as opposed to a regular row of panels. However, they came out great as you can see in the second photo. After the garage door was complete I moved on to the front entry door and the side of the garage has an entry door I also painted. The front entry with the side lights was painted a bright red. In the next photo you can see how I have almost primed over all the red. Once the primer dried I applied the base coat of paint for the wood grain. This is a Sherwin Williams color called Toasty. After that dried I could then start the wood grain painting. I use a lot of tape when wood grain painting. In the next photo you can see how I have taped off for the first sections I will be creating the wood in. I use two different colors of brown for the wood color. Those two colors plus the base coat color actually make three colors to achieve the wood grain look. On these doors I used a SW color called Java for the first coat of wood grain and then the second coat I used a SW color called Turkish Coffee. This next photo is after the first step of wood grain painting using the Java. 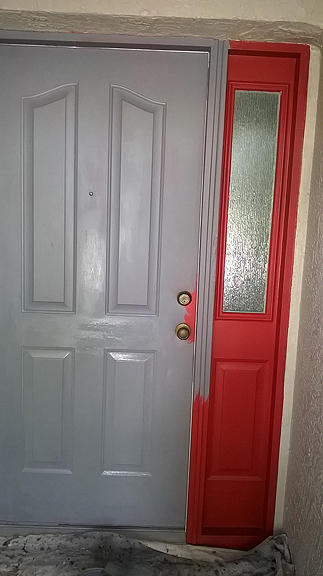 This next photo shows the door after I have finished quite a bit of it. I only have part of the frame work to finish at this point. The next photo shows the completed front entry door painted to look like wood. A really big change from the red door it was when I started. The entry on the side of the garage also was painted to look like wood using the same colors and procedure. This door was originally painted the same as the house color.